The University of the Arts School of Film presents “At the Helm: Women Filmmakers,” a visiting artist program with special support provided by the Academy of Motion Picture Arts and Sciences. The new program continues with a master class, film screening and Q&A session by award-winning filmmaker María Teresa Rodríguez. “María Teresa Rodríguez: The Many Faces of Documentary” master class will be held from 5 to 7 p.m. in 1408 Terra Hall. The class is free and open to the public and the University community, but there is limited space and pre-registration is required. Please e-mail egoidel@uarts.edu to reserve your spot. Beginning with clips from her short student works, which were screened internationally in film festivals, to her present day long form non-fiction, María will discuss the changing face of the documentary over the last decade, as well as touch upon funding, the film festival circuit, and distribution. A screening of “Niños de la Memoria” will be held at 8 p.m. in Connelly Auditorium, 806 Terra Hall, followed by a Q&A with the filmmaker. The screening is free and open to the public and the University community. Niños de la Memoria tells the story of the search for hundreds of children who disappeared during the Salvadoran Civil War. 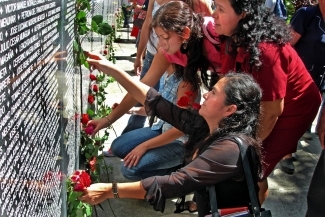 Many were survivors of massacres carried out by the U.S.-trained Salvadoran army. Taken away from the massacre sites by soldiers, some grew up in orphanages or were adopted abroad, losing their history and identity. Niños de la Memoria weaves together three separate yet intertwined journeys in the search for family, identity and justice in El Salvador, and asks the larger question: How can a post-war society right the wrongs of the past? María Teresa Rodríguez is a filmmaker, producer and teaching artist. Her work has won awards in film festivals around the world and has been broadcast nationally on PBS. She recently finished the ITVS & Sundance funded documentary “Niños de la Memoria/Children of Memory” with co-producer Kathryn Smith Pyle. The film, which received a LASA Award of Merit, is currently on the festival circuit. Her previous work includes “Mirror Dance/La Danza del Espejo” (with Frances McElroy), which was broadcast on the PBS Series Independent Lens, received a LASA Award of Merit, a Cine Golden Eagle Award, a First Place for Television Documentary award from the Society of Professional Journalists (Philadelphia Chapter) and was an Imagen Award Documentary Finalist. María worked with Vital Pictures and California Newsreel on the series “Unnatural Causes: Is Inequality Making Us Sick?” which was broadcast nationally on PBS and received a 2009 duPont- Columbia Award in Television and Radio News, a 2009 Council on Foundations Henry Hampton Award and a 2009 Communication Award in TV/Radio/Film from the National Academies. Other work includes: “From Here to There/De Aquí a Allá” which received a First Place Award for Short Documentary at the XVII International Film Festival of Uruguay and “Morningtide,” which won 11 awards internationally. María is the recipient of numerous grants and fellowships including a Pew Fellowship in the Arts, an Independence Foundation Fellowship, and a Leeway Transformation Award which recognizes the work of women artists engaged in social change. She is a 2012 Fulbright Scholar. This entry was posted in Cool stuff and tagged activism, distribution, documentary, El Salvador, events, film festivals, Latin American cinema, production, women on March 31, 2013 by channabach. Paul Sylbert is an Academy Award winning art director and production designer. His films include Heaven Can Wait (Academy Award for Best Art Direction; nominations for Best Picture, Best Director, Best Cinematography, Best Music, Best Adapted Screenplay, Best Actor, Best Supporting Actor, and Best Supporting Actress); The Prince of Tides (nominated for Academy Awards for Best Art Direction, Best Picture, Best Actor, Best Supporting Actress, Best Cinematography, Best Music, Best Adapted Screenplay); One Flew Over the Cuckoo’s Nest (Academy Awards for Best Picture, Best Director, Best Actor, Best Actress, Best Adapted Screenplay; and nominated for Best Supporting Actor, Best Cinematography, Best Editing, and Best Music); Kramer vs. Kramer(Academy Awards for Best Picture, Best Actor, Best Supporting Actress, Best Directing, Best Adapted Screenplay; and nominations for Best Supporting Actor, Best Supporting Actress, Best Cinematography, Best Editing); and three dozen other films. This entry was posted in Cool stuff and tagged disability, events, production on February 21, 2013 by channabach.